This is not what I had planned on baking for you this week, but you guys, these brownies are so ridiculous. I made them for a picnic over the weekend, and I couldn’t believe how awesome they were. I didn’t want to wait. I had to tell you about them right away so you could go make them yourself and get in on all the awesomeness. 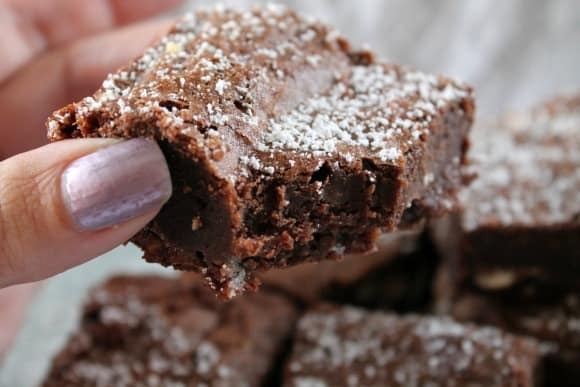 These super fudgy brownies are studded with white chocolate chips. 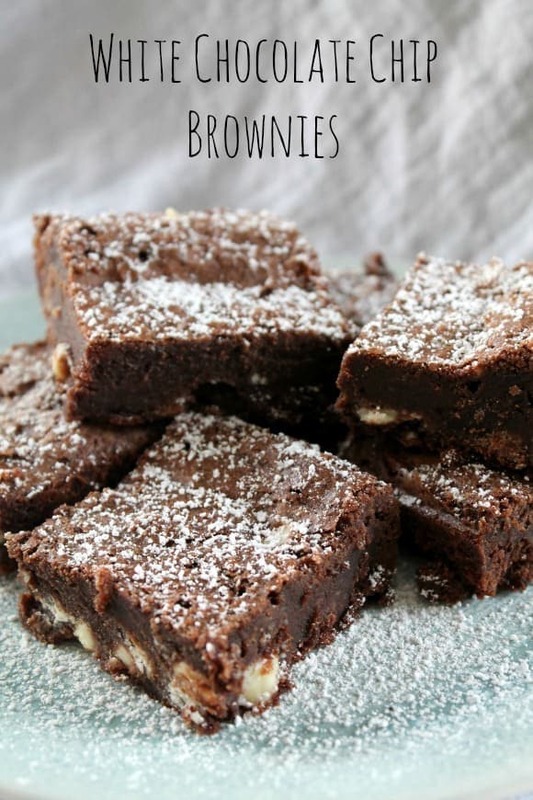 The white chocolate provides a bit of texture as well as a sweet contrast to the dark chocolate brownies. They’re flaky on the top but still soft and almost gooey on the inside. I served them cold, and I think you should definitely give that a try. 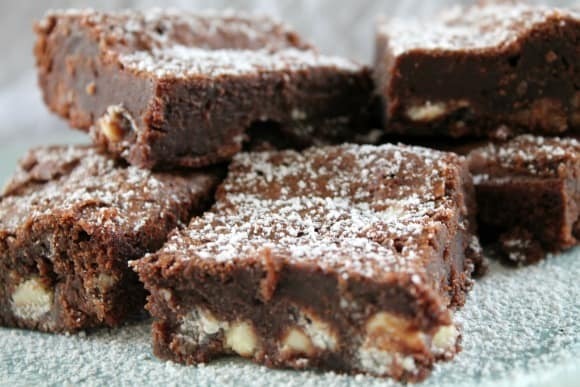 This recipe is from the divine Nigella Lawson, and she calls them Snow-Flecked Brownies. They’d be great to serve at a winter party, but I really don’t think you should wait. Like not even one more minute. Just go ahead and start getting out your pans and melting some butter and chocolate together. I wouldn’t lie to you about something as good as this. I don’t have any cute stories or clever observations this week. I’m just really excited about brownies. What can I say? Chocolate really does it for me. It’s who I am. Get used to it. Preheat oven to 350 and line a 9-inch square pan with foil or parchment. Melt the butter and dark chocolate together in a medium sauce pan over low heat, stirring occasionally. As soon as everything is melted and smooth, remove from heat. Let it sit for five minutes to cool. In a small mixing bowl, whisk together eggs, sugar and vanilla. Slowly stir the mixture in to the cooled chocolate and butter. Beat with a wooden spoon until combined. Fold in the flour and salt until combined, then fold in the white chocolate chips. Pour the batter into your waiting pan and bake for about 25 minutes. You should have a flaky crust on the top. Don't overbake them. The gooeyness is what makes them so dreamy. Do you very best to allow them to cool completely. I refrigerated mine for a few hours before cutting and storing in a tin. If you want to be fancy, sprinkle some powdered sugar over the top. Eat and let your mind be blown. How much flour? You left it out of the ingredient list! Oh no!!!! I’m so sorry. I’ve udpated the recipe. It’s 1-1/2 cups all-purpose flour. Thanks for your help, Katie!